It includes the routes from Tours, Vézelay, Le-Puy-en-Velay, and from the foothills, which converge in the preceding stage. 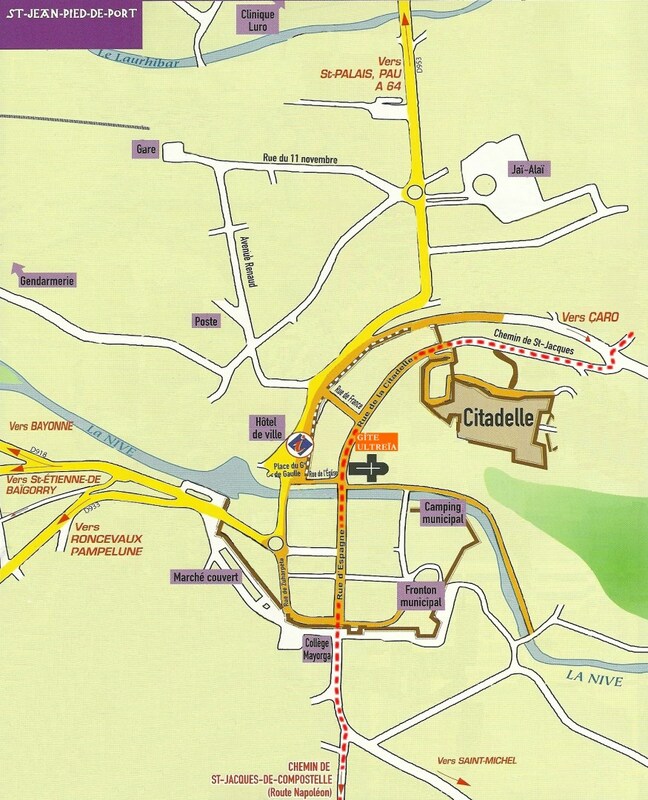 You enter the old town through the Gate of Saint-Jaques and the Rue de la Citadelle. At the lower end of the street, two houses before the church, you will find our Gite ULTREIA at #8, Rue de la Citadelle. which uses the same street, and so also passes in front of our door. Please note: in order to provide peaceful rest between 22h and 6h for all, the hostel closes at 22h. However, we wait for the pilgrims who made a reservation in our hostel and are arriving with the last train arriving at 22h08 on Sundays and bank holidays. If you wish to take the 1st train at 6h10, we will ask you a discret departure for the respect of the other pilgrims, as it is usually asked in Compostella or mountain refuges. Thank you. It takes 10 minutes to walk from the train station to the hostel. The route is marked with arrows. See all the informations here. Cost around 80€ (120€ at night) Duration: 1 H.
Share a taxi with other pilgrims: there are many at the train station…. Look for the shells on the backpacks! Please note: one can neither drive nor park in the historic part of the town in summer. There are many parking lots in St. Jean which are, for now, still free! One can park one’s car there for several days, with the exception of the parking lot near the main square, where parking is prohibited on Mondays and on numerous occasions in the summer. 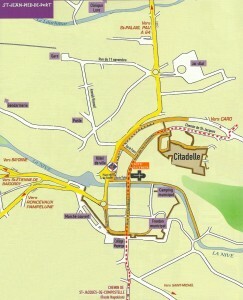 You can consult the city map showing the 2 parkings for several days on the site of the tourist office . There is a possibility of enclosed, secure parking for a fee : 5 € per day at the GarageControle Auto Donibane ( +33 (0)6 83 88 42 33 ) and 32,5 € per week at Renault Garage Arrayet (+33 (0) 5 5937 00 57). The garage Donibane also accepts cars on it’s own outside parking for 2 € per day. So does Mme Iribarne, 1,60€ per day for parking in a former camping, chemin de Zalikarte, +33 (0)5 59 37 11 75. If you are going as far as Santiago de Compostela, it is better to leave your vehicle at Bayonne, where you can then return to it easily by train. The secure parking will then cost you 75 euros for one month (tel. +33 (0)5 59 55 17 49). You can choose, for example, to park at the SNCF train station in Bayonne. You simply need to talk to the attendant upon your arrival. taxi or the Express Bourricot (shared taxi) to St. Jean (one hour and approximately 80 euros in the daytime). take the train “El Topo” to the French border at Hendaye, then change to a train for Bayonne. From Bayonne, choose the train, taxi, or Express Bourricot to St. Jean.